You don't have to be Irish to appreciate St. Patrick's Day. 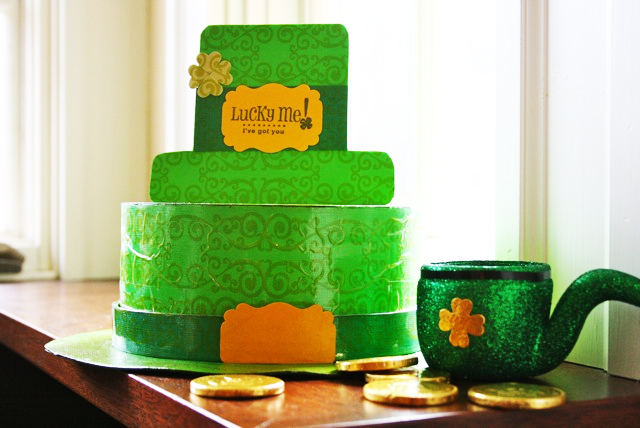 If there's an opportunity to get creative with St. Patrick's Day Crafts, we are in! Also, any excuse to dress in bright green and wear a silly hat works for us. Speaking of Leprechaun hats, here's one made of a round box, green paper and our Scroll Decorative tape. Start with a plain round paper mache box. Cut a piece of chipboard into a circle. Use modge podge glue to add lighter and darker green paper to both sides. Trim away the excess then use more modge podge glue to add it to the box lid. Flip it upside down it's now a "hat"